WEST LAFAYETTE, Ind. — Networking can be a key component in finding successful outcomes in academic, business and social settings. However, finding these important connections in a new environment can prove to be a daunting task. Honors College and Krannert School of Management student Gemma Flanagan aims to break down these barriers with the Student Krannert Hub, a “one-stop shop” to help students learn about clubs, classes and professional development. 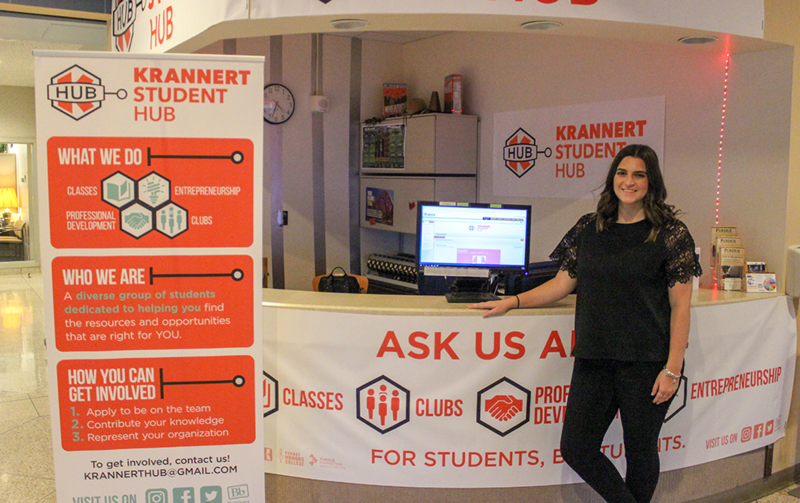 Gemma, who is pursuing Finance along with Strategic and Organizational Management majors, created the Krannert Student Hub to facilitate student networking. Krannert students are able to use the Hub’s resources to connect with each other both inside and outside of the classroom, and it helps them find avenues to explore various interests. Students looking to get more involved in Krannert can go to the Krannert Student Hub and talk to other students about experiences and opportunities on Purdue’s campus. The Hub has a database of clubs and organizations and based on the student’s interests, their peers at the Hub can help them decide how to get involved. The idea for this method of connection began with one of Gemma’s many trips out of the country. Through a study abroad experience in Copenhagen in the Fall 2017 semester, she noticed the Copenhagen Business School offered students a way to explore various opportunities, not just on campus, but also around the city. “Copenhagen had a great program for student life and student involvement,” Gemma noticed. “Through both their building and website, they addressed programming in the city and the school, and helped students find entrepreneurial assistance.” Gemma has used this program, along with similar programs at Ohio State, Princeton, and IU, as a template for the Krannert Student Hub. Gemma’s unique combination of wanderlust and a desire to connect communities resulted in the Krannert Student Hub, which will also serve as her Honors College scholarly project. Students must complete a scholarly project as a requirement for graduation from Purdue’s Honors College. These projects task students with the creation of new knowledge while granting the freedom to be creative and avoid a restrictive checklist of requirements. This allows students to pursue their passions and study multidisciplinary connections that might otherwise go unexplored. Gemma saw the need for better networking within Krannert, and she developed a solution in the form of an easily accessible resource. Providing students with a simple way to network with one another will help connect them with new experiences and open new doors for personal and professional development.